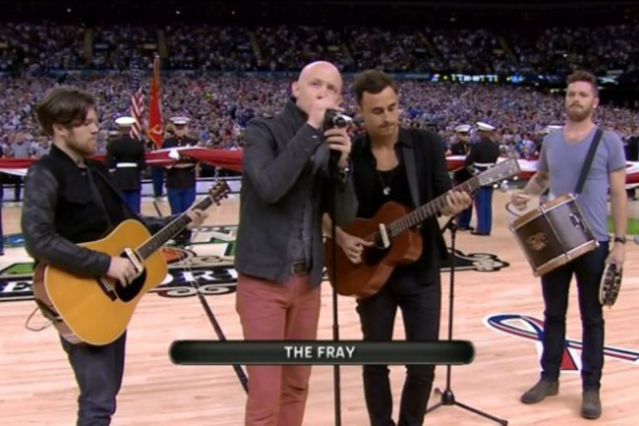 In case your computer hasn’t told you yet, the Fray performed the national anthem at last night’s NCAA championship game in New Orleans, and it was weird. Commenters on VH1’s post about the performance were mighty defensive of the band, but social media remained unforgiving. We’ve collected a few reactions below. Luckily, there are plenty of Fray fans who aren’t NCAA fans. @TheFray yea but JIF and Skippy are both clearly peanut butter. What you did was not CLEARLY our National Anthem. Announced crowd of 70,913 for the title game. Imagine how many more would be here if not for The Fray. I am blaming The Fray if I lose my bracket.Just saying. Regardless of who wins tonight, we know who lost: The Fray. Members of The Fray are taking turns trying to touch the backboard on the Superdome court right now. Not much luck.